It’s become something of a tradition that on New Year’s Day we drive over the M62 to Wakefield. 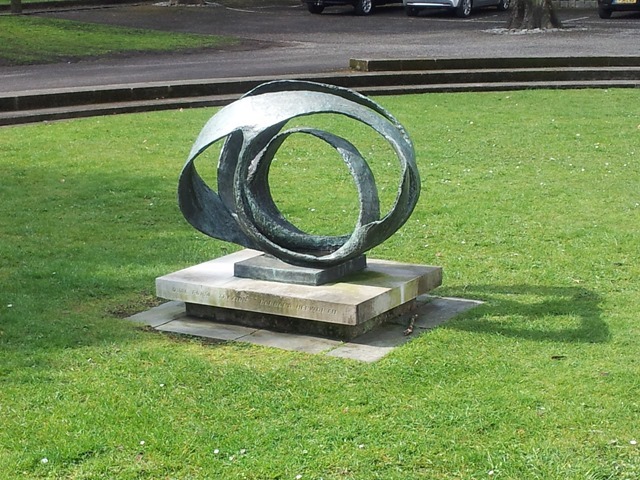 Last year we visited the Yorkshire Sculpture Park, on what ended up being a rather wild wet and windy day. 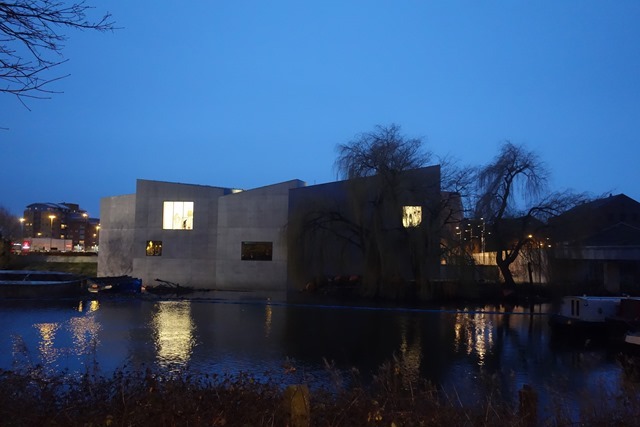 Normally, however, we’ve been to the Hepworth Gallery and that’s what we decided to do for the beginning of 2016. 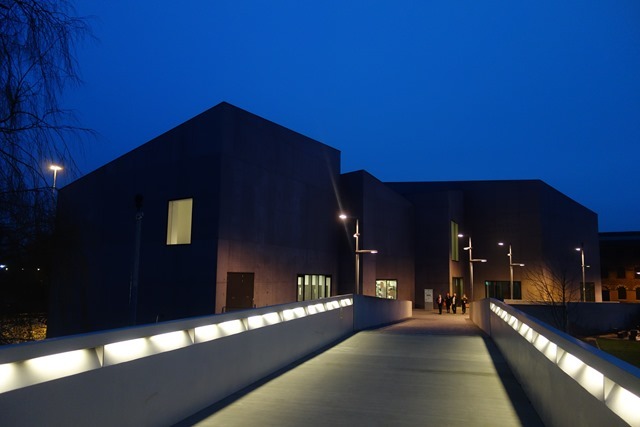 It’s a while since we’d been to the Hepworth – last February in fact – so other than the permanent display from the Hepworth Family Gift and the exhibition of Hepworth at Work everything else had changed since our last visit and there were six new exhibitions to see. Making our way upstairs to the exhibitions on the first floor, we had a foretaste of what was to come, passing this work Untitled (Bent Spoons) (2015) by Enrico Davis whose works were on show in two of the rooms. 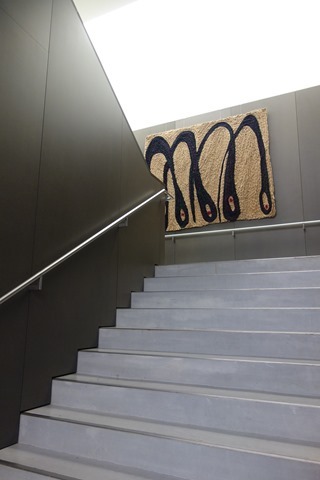 Made from cashmere on canvas – textile based works have been a feature of our gallery visits over the Christmas holidays!. 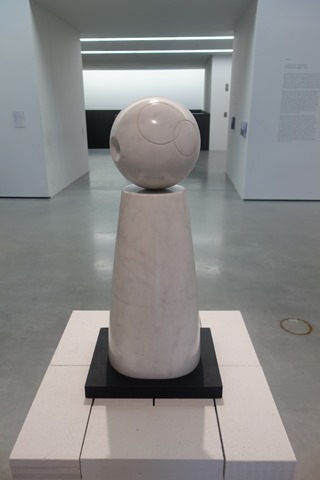 By this point Hepworth had achieved international recognition, representing Britain at the Venice Biennale in 1950, winning the Grand Prix at the Sao Paulo Biennial of 1959, and having Single Form commissioned for the United Nations in the early 1960s. These successes afforded her opportunities to explore new ideas and processes. 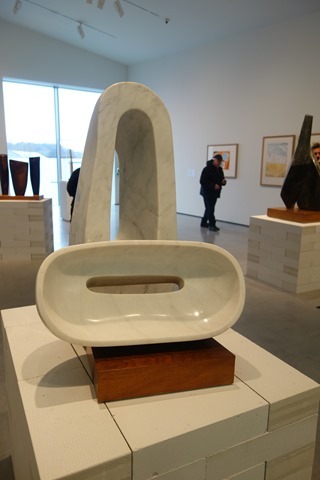 I think he had a point – but with characteristic Hepworth piercings it wouldn’t be very practical! 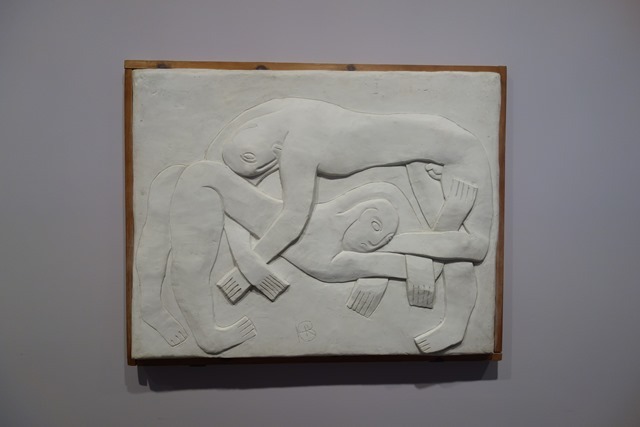 This exhibition brings together sculptures made over a period of three hundred years to explore the changing artistic significance of plaster. 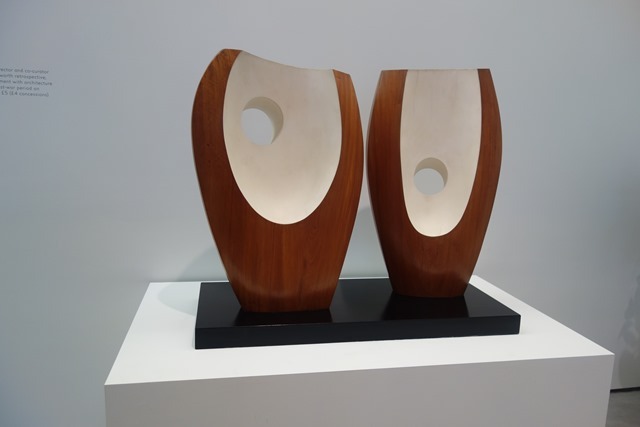 There’s a particular relevance for the Hepworth as they own a large collection of Barbara Hepworth’s prototypes and works in plaster from the Hepworth family gift and have a permanent display of a selection of these. 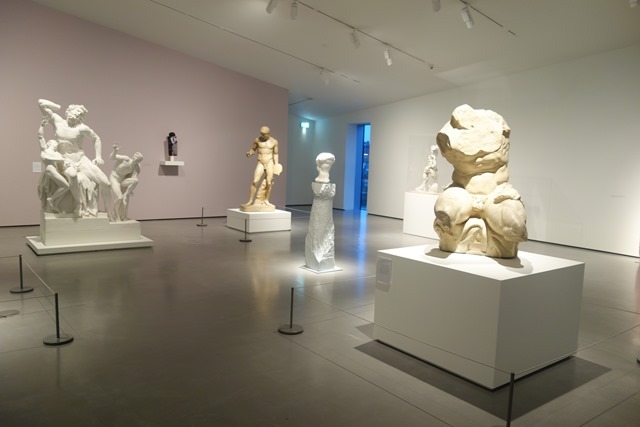 including plaster versions of the classical works the Belvedere Torso and Discobolus. These highlight how casts were used before the invention of photography as a means of reproducing works of art for a wide international audience. 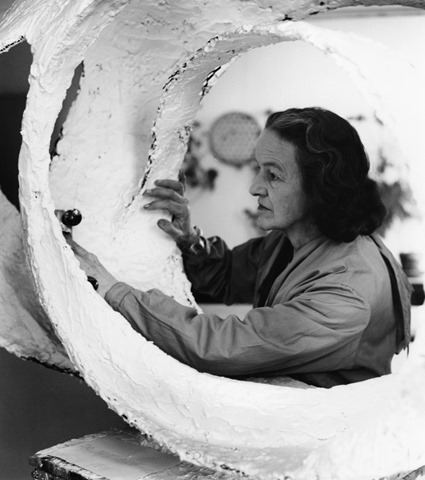 address(ed) how Barbara Hepworth and her contemporaries used plaster both in the process of creating bronze sculptures and as a material in its own right. 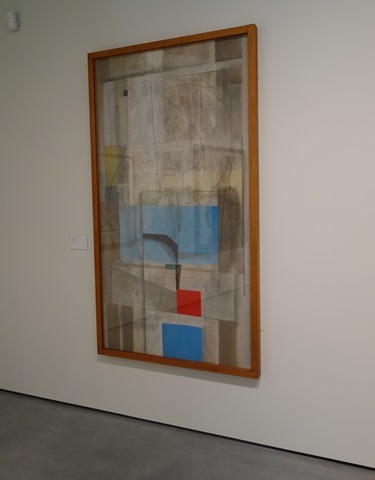 early drawings, paintings and sculpture that show Hepworth’s natural gifts in these areas. Newspaper articles and photography document her early successes and engagement with an academic figurative style that she would soon depart from to find her own artistic voice. 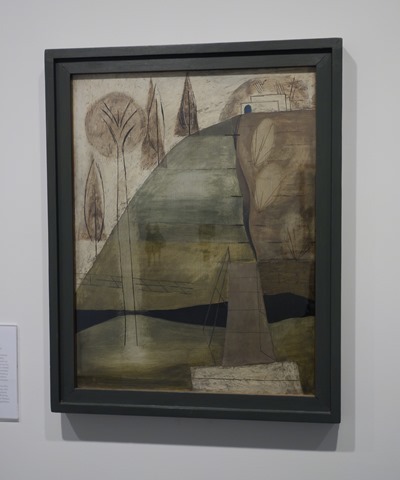 Photographic images Hepworth took or commissioned of Yorkshire will be presented alongside these early works, reflecting her assertion that the experience of growing up in this area was hugely influential. In the adjacent room Des Hughes. 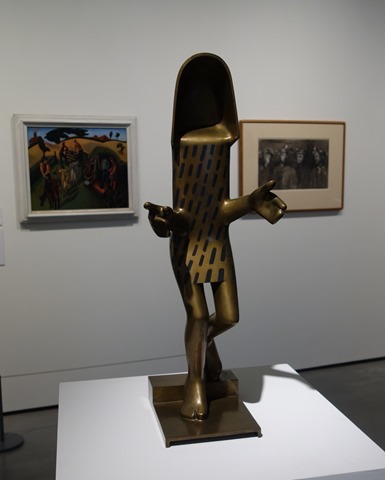 Stretch Out and Wait was an exhibition by the contemporary artist Des Hughes inspired by Henry Moore’s Working Model of Draped Reclining Figure which the latter had donated to his home town of Castleford. 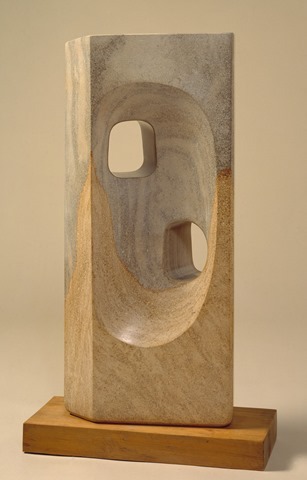 and the other a retrospective by Barbara Hepworth’s contemporary, Gertrude Hermes – Wild Girl. They were both excellent and deserve their own posts as this one has gone on long enough. Another enjoyable New Year’s day. Roll on 2017. 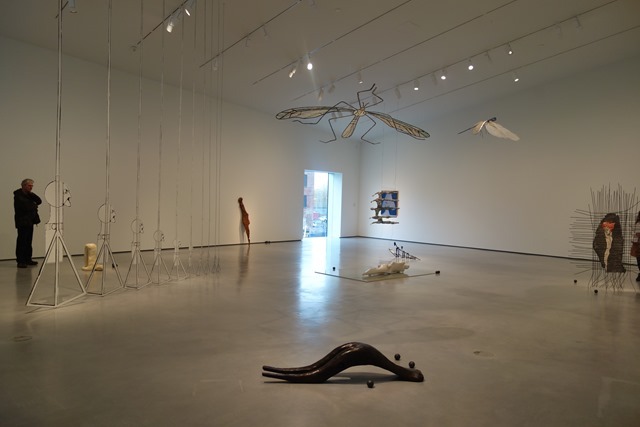 A large number of her works, mainly sculptures but also some prints, were displayed in the rooms on the first floor which are used for the gallery’s temporary exhibitions, but there were also three larger sculptures on the ground floor. 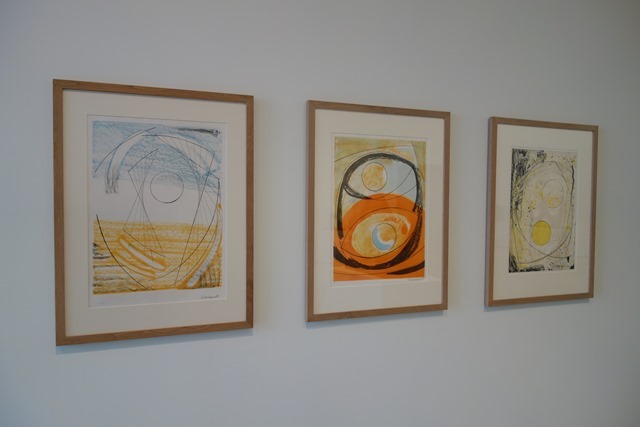 There was also a display of photographs of and related to Barbara Hepworth in another one of the rooms upstairs. Abbot Hall doesn’t allow photography but they do have a number of photographs of the some of the works on display on their website. 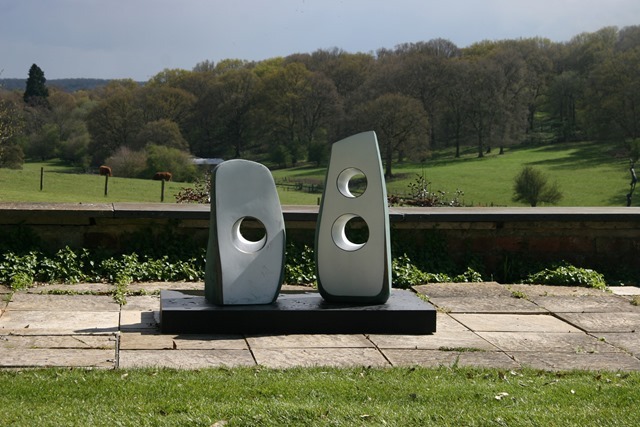 Some of the pictures used in the publicity for the exhibition show sculptures outdoors and this made me expect that some would be sited at Blackwell, as was the case with their exhibition of works by Lynn Chadwick last year, but that isn’t the case. 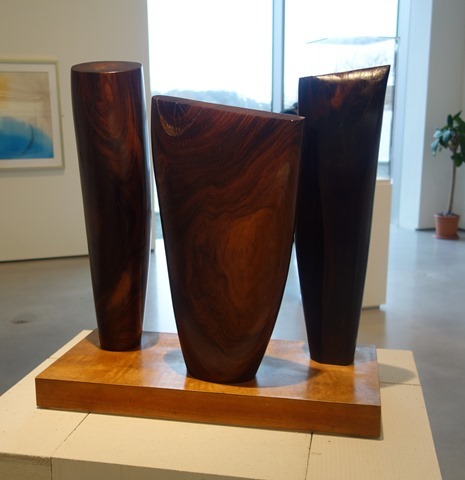 they’re all indoors at the gallery in Kendal – except for the sculpture owned by Abbot Hall which stands on the lawn in front of the entrance to the Gallery (picture above- nothing to stop me snapping that one!). 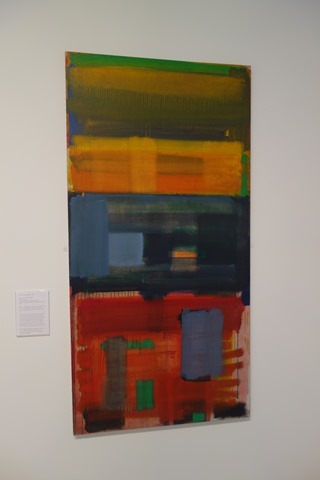 A pity, as the larger works, in particular, would be enhanced by being located outdoors in changing, natural light, rather than in the stark light of the gallery. And on the lawn at Blackwell it would be possible to observe the work from all angles, a problem with some of the works indoors and I noticed that a number of visitors had commented on this in the Visitor’s book. I have to say I agree with them, but a relatively minor quibble as I enjoyed the exhibition very much. 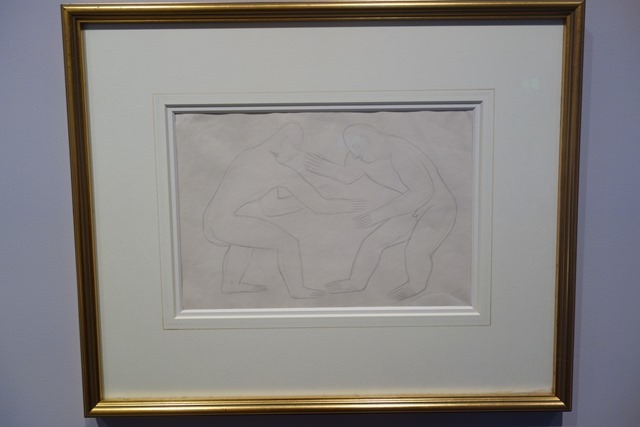 It had a good selection of works, many of which I hadn’t seen before as they had been loaned by private collections. 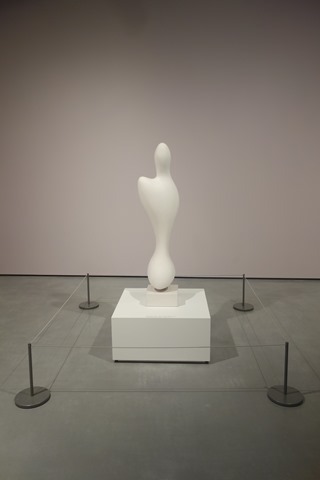 This later work, Summer Dance (1972) greeted visitors to the Gallery as it was located in the entrance hall. 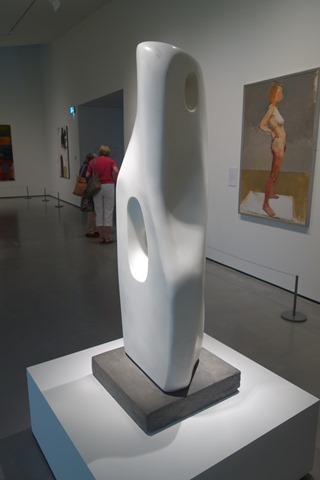 It’s a very typical Hepworth work with large “curvaceous” pieces “punctured” with large holes. At first I though it was carved from wood, but on closer inspection it was apparent that it was cast in metal. The surface treatment was particularly attractive. A light silver on the front, but a darker bronze colour on the back. 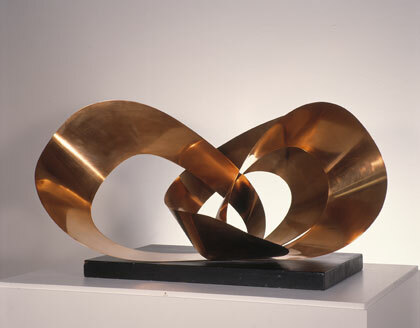 There were examples of works in other media – stone, wood and thin metal plate, the latter sometimes twisted and manipulated into complex shapes, such as Forms in Movement (Galliard) (1956), made from a single copper sheet. 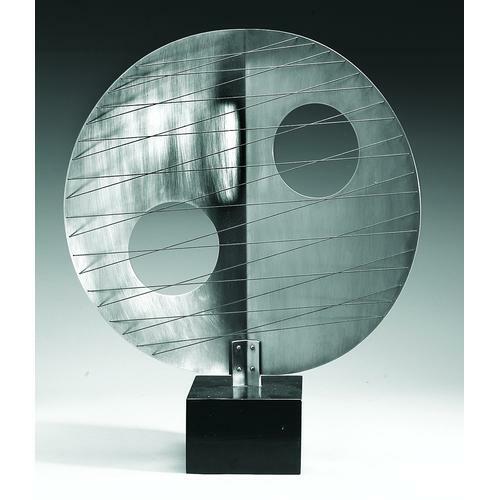 This is another one made from thin sheet metal, but in this case incorporating the strings which are a common feature of her work. 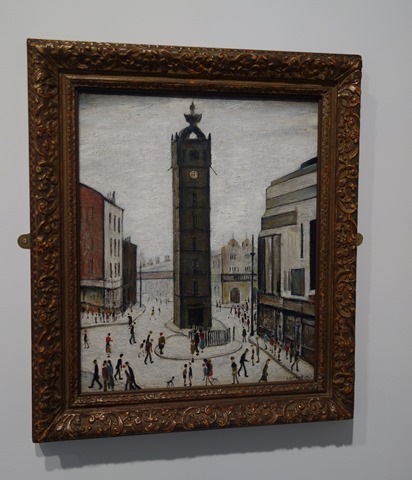 From a private collection, one of the loan conditions probably accounted for it being displayed in a perspex box. This led to some interesting effects due to light being refracted through the joins in the box and illuminating parts of the sculpture. 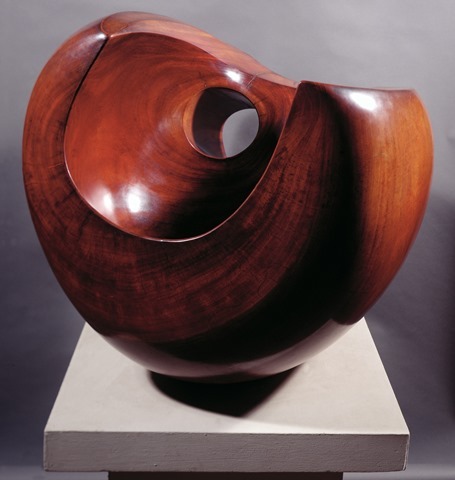 The smooth, curved forms of many of Hepworth’s sculptures, like this one carved from Nigerian wood, are crying out to be touched and caressed – strictly forbidden of course! 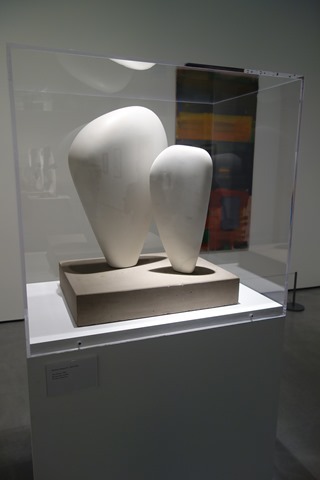 It stood out for me as it’s large rectangular form was rather “masculine” and rather different from the curvaceous works she typically produced. 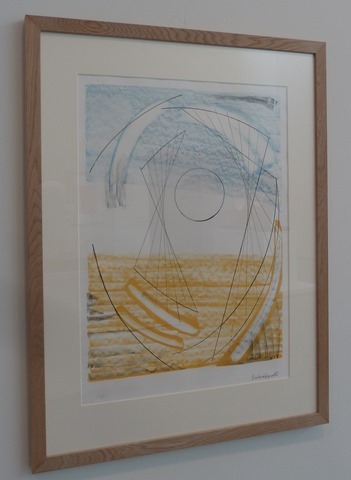 There were also a number of prints which we’d seen before as they were on loan from the Hepworth in Wakefield who had them on display until recently (and where I snapped some photos). So another excellent exhibition at the Abbot Hall. 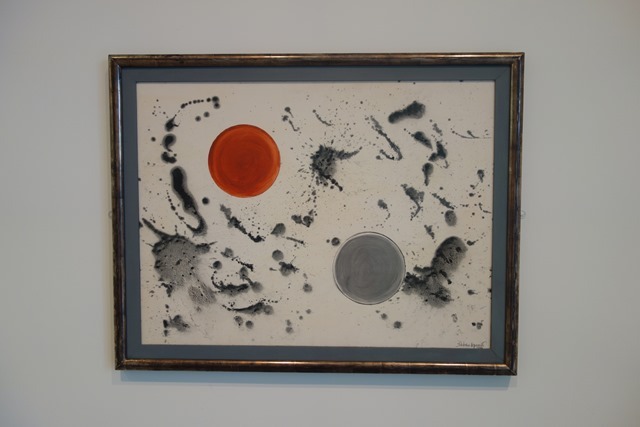 a good survey of Hepworth’s oeuvre, showing works in all the main media she worked in with a good number that are not normally on display to the public, so there was something new even for someone who is very familiar with Hepworth’s work. It is manageable too. A good number of works, but not too many to take in during a visit and enough to make me want to go for another look in the near future. 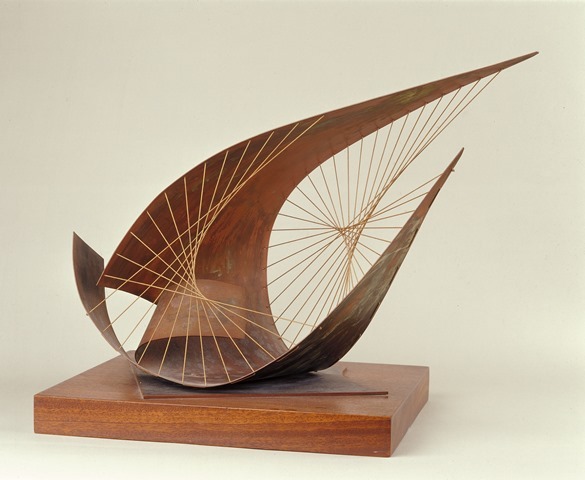 I understand that the Tate are to hold a retrospective of Hepworth’s work next year. I’m sure that will be good too, but it’s likely to be much larger and more overwhelming. 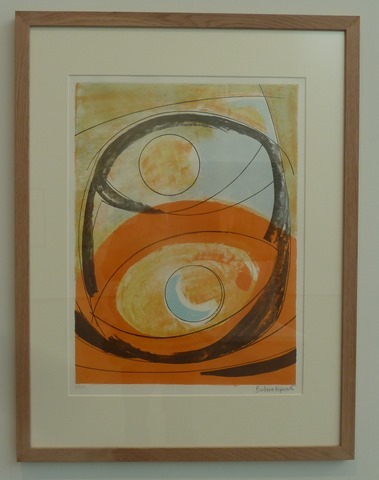 That’s one of the things I like about Abbot Hall – good exhibitions which leave you feeling satisfied but not overstuffed and overwhelmed which is often the case with the “blockbusters” in London. 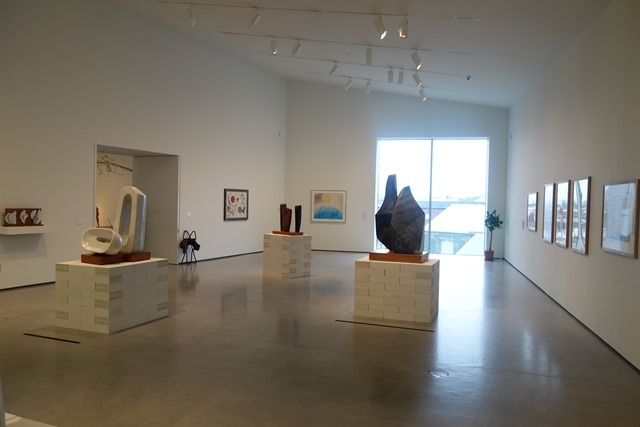 On Saturday we paid a visit to the Hepworth Gallery in Wakefield. Thos time we were accompanied y our friend, Jean who’d never been before. Approaching the gallery in the car, which involves an unusual manoeuvre, driving past the gallery and then doubling back on yourself, Jean commented “what an ugly building” – not a good start as I wondered what she was going to make of the exhibits which included a major exhibition by the Austrian avant garde artist Franz West (more about that in another post). 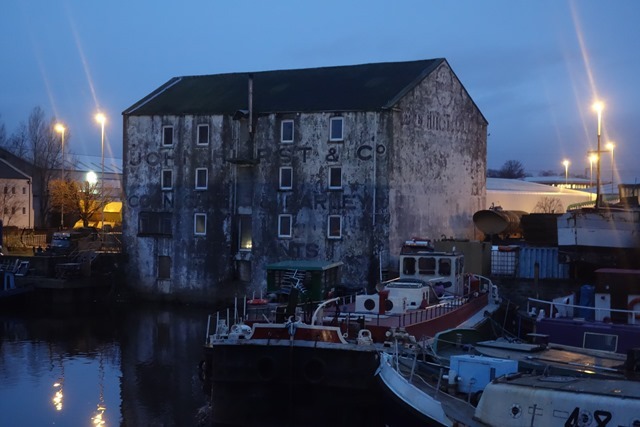 The building does seem to be rather like Marmite – you either love it or hate it – I’m in the former camp. 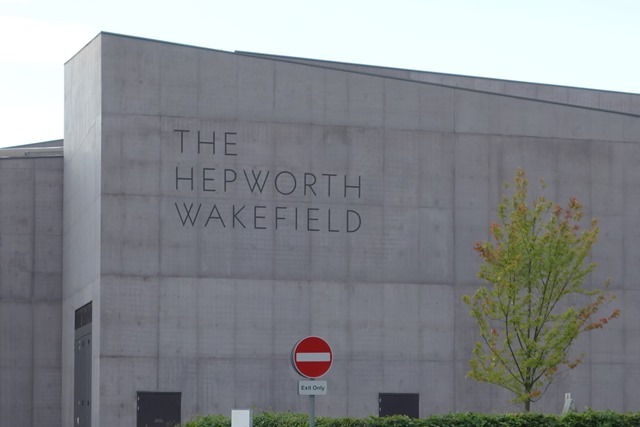 The exhibition once again demonstrated that the Council in Wakefield have had an enlightened attitude to art and culture for many years – continuing right up to today as the establishment of the Hepworth Gallery demonstrates. So again I came away feeling disappointed that my home town, with similar working class demographic and links with mining and Rugby League, is such a cultural black hole. 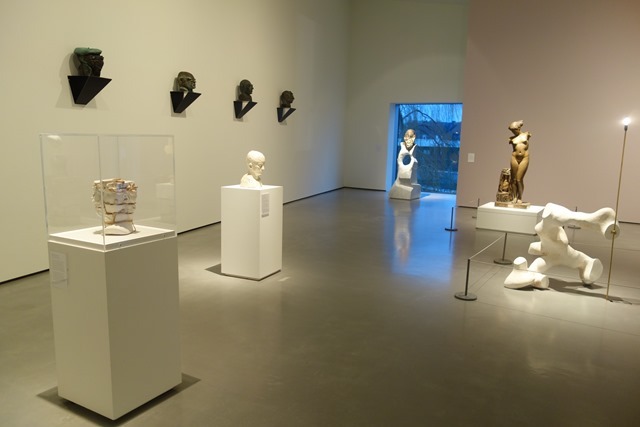 The McNay Art Museum have a good collection of 20th Century sculpture displayed in a gallery in the Jane and Arthur Stieren Center for Exhibitions , in a sculpture garden outside this wing and a few other pieces scattered throughout the grounds. 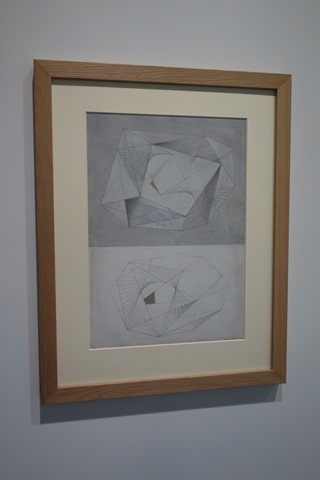 There were also a few pieces displayed inside the main galleries. Here’s a selection.